Seagrass is a natural fibre which is carefully grown and harvested underwater. 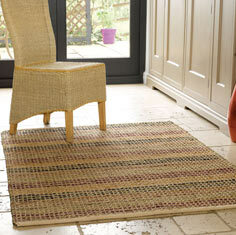 This natural product when woven into a rug / mat can be bland and not very homely looking. Until now! Our new collection of Seagrass rugs features organically dyed yarns that are woven to make a stunning striped pattern, this practical floor-covering is now easy on the eye, hard-wearing and Eco-friendly.